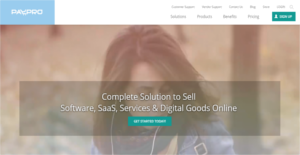 PayPro Global is a suite of eCommerce solutions that cater specifically to software developers and vendors, helping them simplify the distribution and reselling of their digital products, software, SaaS, and other goods to end users all over the world. With PayPro Global, software developers and vendors, they are able to sell and market their products online, accept payments through multiple online channels, increase cart value, and fully visitor to customer conversion rate. In a few mouse clicks, users are able to build e-commerce workflows and processes that address their main business requirements (Product Management, Marketing, Campaigns, Order Management, Advanced Sales Tactics, Business Reporting and many others). PayPro Global also offers a number of plenty of localization and customization options to ensure unhampered, and relentless global e-commerce success for its users. PayPro Global e-commerce products are created to help increase your revenue, meet all your business goals, and ultimately grow your enterprise. With PayPro Global, you enjoy tons of localization services that are branded as one of the best in the industry, ensuring that you are able to maximize your reach to your target customers anywhere in the world, through a comprehensive, total personalized experience. With PayPro Global, you can accept and process payments from your customers wherever they may be. The software offers more than 70 payment options and supports over 110 currencies. This feature also benefits your target and existing customers, as it makes it very convenient for them to pay through the channels and gateways they prefer in their own local currency. PayPro Global’s smart geo-reporting tool enables you to gather and create the whole picture of your business’ current status in different countries and regions so you can plan and implement effective strategies and campaigns. PayPro Global’s intelligent Payment Cascading System streamlines all your payment processes, including complicated transactional processes and procedures, giving you the freedom you need to focus on further generating and growing revenue streams. Coupled with its proprietary Fraud Detection and Prevention systems and team, you can bet that your e-commerce operations are running smoothly and securely with zero worries on incidents. On the average, about 10% of credit card transactions around the world are declined because payment processing systems have become inefficient. PayPro Global’s payment processing system is built to fully maximize the conversion rate, via its proprietary cascading routing system, which helps businesses recover as much as 40% revenue from previously unfinished or abandoned orders. Churn rates are an industry-specific challenge, affecting many merchants and sellers of all types and sizes all over the world. Retention is a critical ingredient of a successful and solid e-commerce business, which is why PayPro Global’s proprietary Lead Management System, loyalty tools, and subscription renewal modules spell a huge difference for all their vendors. Business data is vital for rapid and immediate tactical responses and efficient business strategies. PayPro invests substantial resources to gather, store, organize and make available all data related to a vendor’s e-commerce operations. The software provides access to over 30 pre-defined reports, focusing on several key performance indicators, along with the freedom to create personalized reports and define access levels for each member of the vendor’s team. If you are considering PayPro Global it might also be beneficial to investigate other subcategories of Best eCommerce Software gathered in our base of B2B software reviews. Every enterprise has different requirements and needs a software that can be personalized for their size, kind of workers and clients, and the specific industry they are in. For these reasons, no software can provide perfect functionality off-the-shelf. When you look for a software app, first be sure what you require it for. Read some PayPro Global reviews and ask yourself do you desire basic features or do you want advanced features? Are there any industry-specific tools that you are looking for? Obtain the answers to these questions to help your search. There are plenty of aspects that you need to mull over and these include your budget, particular business needs, your company size, integration requirements etc. Take your time, try out a few free trials, and finally choose the platform that provides all that you want to improve your firm competence and productivity. How Much Does PayPro Global Cost? We realize that when you make a decision to buy eCommerce Software it’s important not only to see how experts evaluate it in their reviews, but also to find out if the real people and companies that buy it are actually satisfied with the product. That’s why we’ve created our behavior-based Customer Satisfaction Algorithm™ that gathers customer reviews, comments and PayPro Global reviews across a wide range of social media sites. The data is then presented in an easy to digest form showing how many people had positive and negative experience with PayPro Global. With that information at hand you should be equipped to make an informed buying decision that you won’t regret. What are PayPro Global pricing details? What integrations are available for PayPro Global?